Diapers are for babies, Pull-Ups are for toddlers. Acknowledging This Important Achievement. Potty training isn’t just a skill – it’s actually the signature developmental achievement of toddlerhood. Toddlers’ brains and abilities aren’t fully developed, so mastering a complex skill like potty training is a pretty tall order. This iconic journey requires coordinated physical, emotional, moral and cognitive development along the way. Switching from diapers into Pull-Ups shows your child you appreciate – and support – all the growth that’s gone into the major transition from passive baby into active toddler. You’re In It Together. Now that the potty training journey has begun, make the first time they put on a Pull-Up a special one. This is an opportunity to reinforce the promise that you’re in it together, on the potty training journey and beyond. This Potty Promise has two parts – your toddler’s drive to be a Big Kid, and your support, love, and dependability along the way. Make this a bonding moment for both of you -- one that sets the tone for your parent/child partnership. You’ll get through this as a team! Consistency Boosts Learning. Toddlers (especially Turtles and Owls) thrive on consistency, which helps them practice and feel comfortable with their new skills. You can help by explaining to your child that diapers were made for babies, but Pull-Ups were made for toddlers who are learning to be Big Kids. 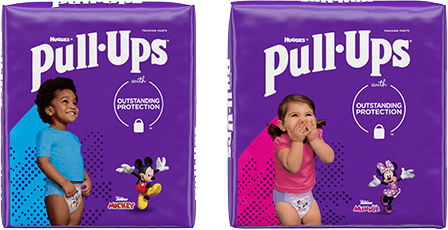 Pull-Ups help during potty training because they’re designed specifically to help your child learn and practice new skills, like pulling pants up and down. Ditching the diapers and sticking with Pull-Ups helps remind your child of the new potty skills they’re working so hard to learn. Potty training is a process, with you and your child working together toward the same goal. Your toddler is working to build a complex, lifelong skill over this potty training journey, with your help along the way. Your guidance, support, and patience will help set the tone of your relationship for the years to come. We can help too, providing everything you need to make your journey together a successful one. Making the big switch into Pull-Ups helps your child take pride in -- and celebrate -- this important developmental achievement!